Please consider others by keeping sick children at home in an effort to contain the sickness. Viruses can spread very quickly in school environments causing considerable ill-health and disruption to teaching programs. Please refer to the Recommended Exclusion Periods for Infectious Conditions, such as measles and chickenpox, produced by the Australian Government's National Health & Medical Research Council. If a child reports sick or is hurt/injured seriously enough to require further attention, the school will ring the parent/caregiver. If we are unable to notify the parent/caregiver an effort will be made to contact the person nominated on the family details information sheet. If no contact can be made, the Principal or delegate will make decisions in good faith for the best interests of the child. For injuries sustained at school, for which there is concern, the parent/caregiver will be notified by phone call or letter as a follow-up. Parents are asked to check their child’s scalp regularly for lice. What happens if your child gets head lice? 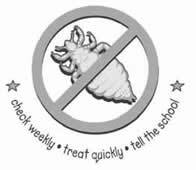 DON’T PANIC – Most children have head lice at some time in their school life. Begin treatment immediately and check for effectiveness. Send your child back to school as soon as effective treatment has commenced. Your child is not a risk to others as long as treatment has commenced. Parents/caregivers may wish to use the free service provided by the school dental therapists. Each year the dental unit visits the school for a number of weeks. Throughout the year, you are able to access the facility even though it is located at another site. In order to be referred to the appropriate Dental Unit, it is necessary to phone the Toowoomba Base Hospital (Ph 4631 6436) as all appointments are co-ordinated at the Hospital.